You’re right, she is a beautiful woman and the picture you’ve drawn is great. Congratulations! Josem Thank you for your wonderful comment. I’m really glad to hear that, thank you so much. Matt thank you for the warm comment. i agree with you, she’s one of my favorite actress as well. I love this. Beautiful Job. Dacid Thank you so much…. Madame Kelly many thanks for the wonderful comment. Madame George your comment is very much appreciated. it’s ALL about the eyes Nanoy, and your really did an awesome job here! Stan i really appreciate your encouraging comment, Thank you so much. Violet thank you so much for the rousing comment, very much appreciated. Sedge thank you for the very nice comment. Thank you for the warm comment. Ashley It’s very nice of you, many thanks. Sing thank you so much. Wonderful details dear,you portrayed her beautifully before us. so much attractive image of your skilled work. Thats a very nice comment very encouraging!!! Thank you so much. Stunningly breath-taking picture. Show-casts your creative self in the best. Liv Tyler is been my favorite actor since I was a child. She is a rare beauty. Your picture has captured her beauty well. I loved it. Great work of art 🙂 Keep more of them coming. Asha you made my day!!! thank you for your kind words. Yessie thank so much for the warm comment. I love Ralph Fiennes and Liv Tyler’s acting in Onegin. Liv is a woman with classy features. I love the lips’ part of drawing. It’s really Liv. Great job, Nonoy Manga! Lay what a heart breaking movie ha, your comment is very much appreciated thank you. Really like this one Nonoy! Little brown thank you so much. Your old news was new news to me. This is a wonderful drawing and very expressive. Although you have drawn someone who is famous, there is much more to this drawing than just being a drawing of someone who is famous. I found this drawing to be very compelling before I read your post and found out that it was a drawing of Liv Tyler. Truly a wonderful drawing! Man your comment is very much appreciated, thank you.. This is great! Do you sell your work? or swap with other artists/photographers? Ed Eurythmics a great band, my uncle introduce me to some of the video of Annie Lennox in youtube only. thanks for the warm comment. Dela thank you so much. Asha its very kind of you nominating my blog, thank you..
Beautiful. I really like how you did it over the newspaper…the effect of the transpaprent colours on the newspaper is very creative and imaginative. Red your comment is very much appreciated, thank you so much. Absolute stunning … what a talent you have. Viveka thank you for the lovely comment. Beautiful, you have great skill. And thanks Nonoy for dropping by my site, very appreciated. Your welcome i love your blog, thanks for the warm comment. That’s a lovely Liv indeed, N.M! And I’m really digging the visual layers you’ve created here by adding the text and fading from b/w to color… very impressive work! Man that’s a nice comment many thanks…. Nofoso thanks for the favorable comment. There are great looks, but also greatness of spirit. That’s what makes her face so memorable. Like your art approach. Kristen I really appreciate your wonderful comment thank you so much. Robert your comment is very much appreciated, thank you. 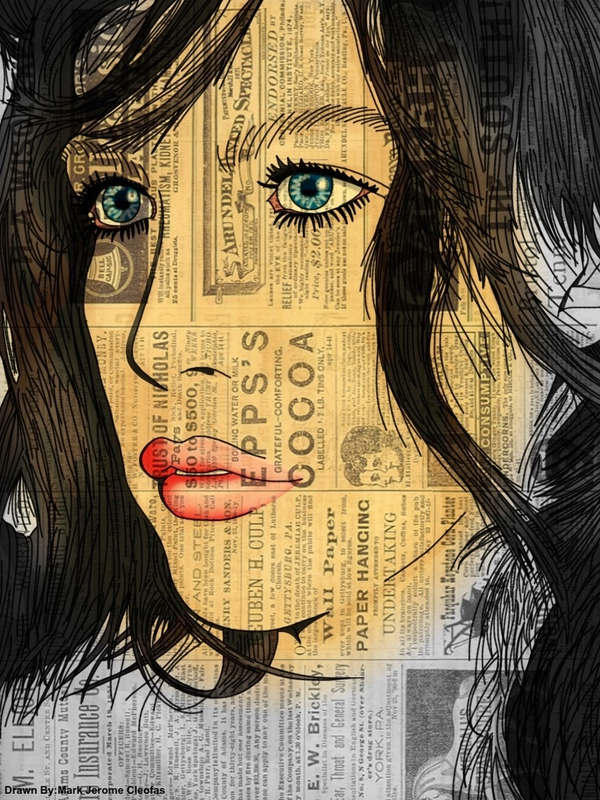 I like the way you drew her on newspaper, a public medium, and she is a public figure. Terrific drawing skills Nonoy! Madame Susan many thanks, your comment is very much appreciated. Wow, lovely work! Those colors are perfect. Irv you made my day thank you. Very nice, an awesome case of superimposing images! Williams thank you so much. Dana thank you for the warm comment, very much appreciated. Thank for the very nice comment. Madame Ruth your comment is very much appreciate thank you so much. I can relate to this. I used to draw my the idol I have a crush on when I was 13. Of course we all get better. 😉 It’s an awesome image my friend. The way you underlayered Liv’s face with news prints makes her seems so timeless. Aeborn you made my day that’s a very nice comment. Thank you. It’s a pleasure, my friend. I love it when someone is creative . Ana thank you so much. Excellent portrait! Loving the style. Nicely done. You have her mouth, which I would think would be one of the trickiest bits to get right. Yousei your comment is very much appreciated thank you so much. She is pretty, isn’t she? 🙂 This is just fantastic, Noynoy! Rigel man thank you for the very nice comment. Without a doubt u have so much potentials as an artist and a talent so rare. Keep developing and drawing who u r and what u embrace. Rona your comment is very much appreciated thank you. Very beautiful subject. Thank you Nonoy for all your likes. Your welcome, thank you for your kind words. Really nice, I love it on the news print/ How about Bernardo Bertolucci’s “Stealing Beauty,” that is a good one. Indeed Liv Tyler is very beautiful and innocent look in that movie, thank you so much for the warm comment. Beverly thank you for. Your kind words. Val your comment is very much appreciated, thank you. Wow, she is definitely striking, and your depiction of her does her justice. Great job! Madame Yulia thank you so much. Tiina thank you so much. I’ve been on vacation and didn’t get a chance to get over here. I love her to! Your artwork is wonderful! I had never heard of “Onegin” though. I’ll have to check into finding that. Madame Sherry your comment is very much appreciated, Thank you so much. Je vois que j’ai a faire a une véritable artiste,génial le papier journal pour le visage. Wonderful drawing, she is beautiful. Your rendering is excellent! And I, too, like the newspaper. Draw Rosie Huntington Whitely ! dont worry .. lemme be your BODY GUARD ! Jae its very nice of you, thank you for the encouraging comment. Liv looked gorgeous with pointy ears. I wonder what other starlets would be more beautiful with elven ears. Indeed thank you so much. Amazing piece of art!! keep up the good work. Suraj thank you for your kind words. I just discovered your blog and I love it ! Thank you for sharing your beautiful talent with us. Daya your welcome, thank you for the very nice comment. This is breathtakingly brilliant work Nonoy! So realistic too! Michael your comment is very much appreciated, thank you so much. Eof737 Thank you for your kind words…. Nonoy, are you selling this painting/artwork? Even if I want to my mother would not let it she keeps all my original art work. For the mine time she want me just to study. Business is prohibited ha ha ha. What a Miserable life LOL anyway thanks for asking. Finally your back, thank you for the nice comment. 😀 Thanks! And no problem! You did such a great job!! Amazing! Madame Mimo thats’s a very nice comment thanks again. Shery thank you for the warm comment. I love those movies too. Thanks again. Oh wow! I can’t believe you draw it! She is so beautiful! Are you drawing by hand and then on the computer? i draw by hand papers and computer, thanks for the warm comment. Baciii thank you again for the very encouraging words. That is an amazing piece! And I love Onegin. Thank you for the encouraging comment..
Nice! 🙂 I’ve never draw on a newspaper, I should try too ^_^ I really like the look of it. Nice work! Elenya thank you for the very nice comment. Old news is often good news. God work. Gives new meaning to “A picture is worth a thousand words. Words that look good! Nice for a change. Good choice of accent colors. They are two of my favorite colours. Je ne reçois plus de notifications. great illustration, she is very endearing as an actress and human! she certainly is one of the purest looking women in present hollywood, pure and sensual. well thats a very nice comment, thank you!